Abstract. In this paper, we describe the development and application of a new spatially explicit weathering scheme within the University of Victoria Earth System Climate Model (UVic ESCM). We integrated a dataset of modern-day lithology with a number of previously devised parameterizations for weathering dependency on temperature, primary productivity, and runoff. We tested the model with simulations of future carbon cycle perturbations, comparing a number of emission scenarios and model versions with each other and with zero-dimensional equivalents of each experiment. 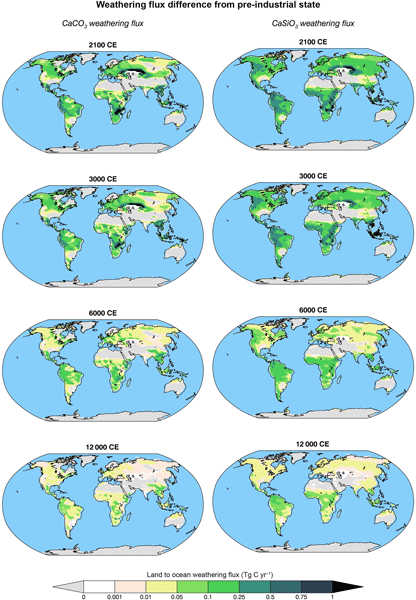 Overall, we found that our two-dimensional weathering model versions were more efficient in restoring the carbon cycle to its pre-industrial state following the pulse emissions than their zero-dimensional counterparts; however, in either case the effect of this weathering negative feedback on the global carbon cycle was small on timescales of less than 1000 years. According to model results, the largest contribution to future changes in weathering rates came from the expansion of tropical and mid-latitude vegetation in grid cells dominated by weathering-vulnerable rock types, whereas changes in temperature and river runoff had a more modest direct effect. Our results also confirmed that silicate weathering is the only mechanism that can lead to a full recovery of the carbon cycle to pre-industrial levels on multimillennial timescales. 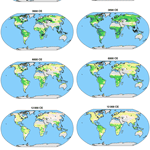 How to cite: Brault, M.-O., Matthews, H. D., and Mysak, L. A.: The importance of terrestrial weathering changes in multimillennial recovery of the global carbon cycle: a two-dimensional perspective, Earth Syst. Dynam., 8, 455-475, https://doi.org/10.5194/esd-8-455-2017, 2017. In this paper we describe the development and application of a new spatially explicit weathering scheme within the University of Victoria Earth System Climate Model (UVic ESCM). We integrated a dataset of modern-day lithology with a number of previously devised parameterizations for weathering dependency on temperature, primary productivity, and runoff. We tested the model with simulations of future carbon cycle perturbations and confirmed the importance of silicate weathering in the long term.